**** Chosen by Winner: Alex W.
The Kizer Michael Vagnino / Tom Ferry designed Zipslip isn't just a great everyday carry knife, it's an everywhere carry knife. 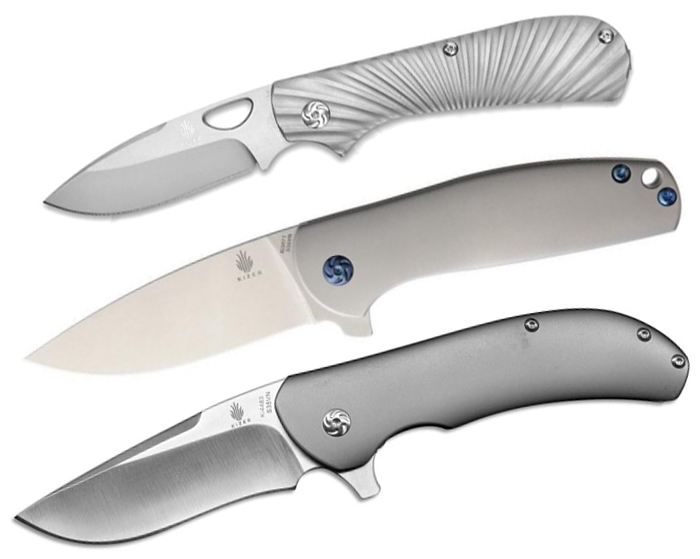 This update to the traditional slipjoint folder comes from the minds of Michael Vagnino and Tom Ferry, sporting a fluted titanium handle and the innovative Everflush backbar. The backbar allows the addition of easy one-handed opening to a slipjoint folding knife design. The Kizer Michael Vagnino designed Velox 2 knife provides form and function while maintaining a low profile. It features an ingeniously hidden flipper that adds to the innocuous appearance. It has a slim drop point style blade made from CPM-S35VN. The handle is 6AL4V titanium in a classic matte gray finish. A sturdy frame lock, custom pivot, and a tip-up carry pocket clip make this an ideal daily companion. The Kizer Michael Vagnino designed Eliminator 2 offers a powerful recurve blade and an ergonomically contoured handle. Inspired by the Surf Rock band the Eliminators, this flipper has a sleek design that will "Wipe Out" the competition. It has a drop point blade made from CPM-S35VN with a satin finish. The handle consists of two titanium scales in a classic matte gray finish. A sturdy frame lock, custom pivot, and a tip-up carry pocket clip finish off the piece.